The new family history card game, Six Generations, is not just another game. This deck is an invention in the card gaming and gambling industries, the result of which is impossible now to predict, since it could change the regular deck of cards in many known games. Let’s look closely at the traditional deck of cards. It has a family tree, consisting of the King, the Queen, and the Jack, their son, who is going to become the King. There are four families like that in each deck, representing four kingdoms in Europe. At the time when this familiar deck of card was created, the important people in Europe where actually those three characters – the King, the Queen and the Jack – the family who ran their kingdoms. The game creator of the past did not even include some other figures, standing close to the family of ruling characters – like daughters, or cousins, or, say, the military or religious leaders, as in the game of chess, because of their social noncompetitive unimportance. To legitimize their royal bloodline and not compromise the superiority of the throne, Monarchs built their family tree focusing only on one person, usually a ruling man, from the older generation. They would show their family history, going back for centuries, to some very important ruler of the past. The lineage of mothers and grandparents, very often not of nobility, were sometimes not acknowledged at all. The old deck of cards comes to our time exactly like that, and all the card games which have been created from this base incorporate the cultural hierarchy in their designs and rules. Creating powerful and cooperative relationships between these four European kingdoms remains the root of most of these old card games. Democracy, in comparison, changes our image of the family tree. 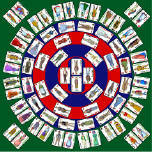 In reality, the amount of ancestors each person has doubles in each older generation, and every character in the family tree is important and is shown in this modern “democratic” deck of cards, which I call my deck of Six Generations cards. Today fewer kingdoms exist and the rule of government is no longer passed from fathers to their children. I have created this new deck of cards showing all the relatives in the family for six generations, without having missed anyone. In the old version of the card deck we have 13 rows of cards, starting at two through the Ace, making 52 cards, and they come in 4 columns. In my deck I have six rows of cards, representing 6 generations. But the amount of cards in each row is unequal. There are two cards in the generation 1, two in generation 2, four cards in generation 3, eight cards in generation 4, sixteen cards in generation 5 and forty cards in generation 6. The game Six Generations has 72 cards, and rules are included with each deck. Players can also utilize these new cards in games they have been playing all their lives. The simplest example is the game the “21”. 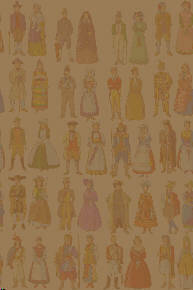 What also makes the Six Generations deck of cards very different from the older deck with just three characters, is that each card has a drawing of the full standing man or woman in the ethnic European costume, with the most popular or common first name from the time and the country they were from. The youngest generation consists of Emily and Jacob, sister and brother living in the United States in our days. These two names are now the most popular in the USA. The possibilities of creating new versions and editions of the card game Six Generations are endless. We can make the family set for each country, in their native language. Or we can take any two-century period of time, since ancient Egypt, and show the family in period costumes. Who knows, perhaps exposing Americans to the historic costumes of their past could influence the design of things they wear everyday. America is a country where everything new, which has value, will eventually find its station and its users. It might take some time before Las Vegas will accept this new deck to play poker in their casinos, but the time could come. Immigration From Europe To America Edition.